It was Robert Heinlein who inspired me to go into medical research. 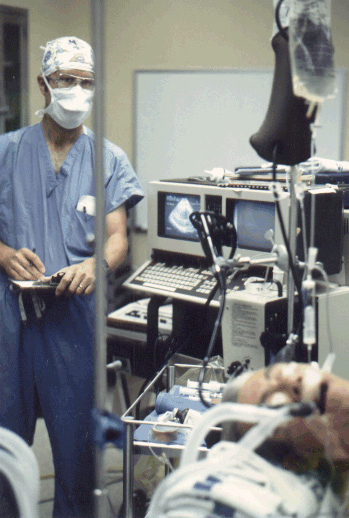 In this picture, a patient is about to undergo a coronary artery bypass graft operation. Here I am collecting data for our research project on intraoperative cardiac wall motion. The device to my left is an ultrasound machine equipped to do two-dimensional transesophageal echocardiography (TEE). At the time of this photo, the procedure was experimental and its value in the operating room unclear. Today, TEE is a valuable tool found in operating rooms throughout the U.S. and around the world. How many of us owe Robert Heinlein a debt of thanks?